Dr. Yoshiki Sasai clarified the molecular entities of "neural-inducing factors" that start the generation of nervous tissue by using early embryos of amphibians and mammals, and thereby elucidated the differentiation regulation mechanism of brain generation that has long been a mystery heretofore. By developing these researches further, he clarified genes that regulate the generation of brains and their networks one after another, and has established the principles of complex formation of brains and sensing tissue. On the basis of these principles, Dr. Sasai has recently been engaging in the development of in vitro differentiation methods for the ES cells and iPS cells of mice and humans as well as culturing methods for such cells in large quantity, and has achieved success, for the first time in the world, in the development of differentiation-inducing technologies with high efficiency for the cells of the central nervous system such as neurons in the cerebrum, cerebellum, hypothalamus, etc., dopamine-producing nerve cells, retinal cells, and others. These can be applied to clinical researches as fundamental technologies for regenerative medicine by means of transplantation for the treatment of Parkinson's disease, etc. In addition to the development of these differentiation-inducing technologies for cells, Dr. Sasai has recently been engaging in the development of cubic tissue-building technologies that are three-dimensional like those in living bodies by regulating the microenvironments for the generation of cells induced by differentiation, and has achieved success in the development of technologies for the method of forming three-dimensional and cubic tissue from pluripotent stem cells such as ES cells. And he achieved success for the first time in the world in the development of technologies for the three-dimensional and cubic building of retina tissue having complex layer structure that is the same as that in living bodies of which development was said to be difficult heretofore and further of functional pituitary gland tissue. These can be epoch-making technology that will open up the next generation regenerative medicine. Due to the aforesaid reasons, Dr. Yoshiki Sasai will be an awardee of the 12th Yamazaki-Teiichi Prize in the field of bio-science and bio-technology. Tissues such as brain and retina have low regenerative potentials. Once injured, these tissues are unlikely to recover spontaneously. For this reason, no valid method of treatment is available for neurodegenerative disease, degenerative retinal disease and so on although their prevalence is high. “Regenerative medicine,” which attempts to produce new cells or tissues of the type identical to the injured cells in a test tube from pluripotent stem cells, is a rational approach to treatment of these diseases. However, there are many issues left unresolved before preparing cells needed for their treatment. The central nervous system (CNS) of vertebrates (including mammals) is the most complex organ constituting the living body. The mechanism for formation of such a sophisticated system is a major mystery in biology. If such a complex mechanism for formation of the CNS can be reproduced in vitro and if the parts of CNS such as brain cells and tissues can be produced, it will contribute greatly to advancing regenerative medicine, drug creation research and so on. To date, however, such attempts have involved difficulties. Among others, the cerebral cortex and retina composed of complex structures are made of multiple layers of different types of cells. Although conventional studies on creation of simple tissues through combining macromolecular materials with cells (i.e., “tissue engineering”) have yielded outcomes valuable to some extent, it has been totally impossible to create highly sophisticated tissues such as cerebral cortex and retina. The winner of this award analyzed the brain tissue formation during the course of embryonic development and reproduced such a microenvironment in vitro, succeeding in guiding these tissues to exert their inherent potentials of self-organization and inducing spontaneous formation of the tissues. Pluripotent stem cells such as ES cell and iPS cell are expected to play a central role as raw materials for creation of cells useful in cell grafting for regenerative medicine. The award winner attempted to resolve the two major technical issues serving as obstacles against medical application of pluripotent stem cells, achieving the notable outcomes specified below. A) A method for selective differentiation and incubation of pluripotent stem cells to yield various neurons of the CNS (cerebrum, midbrain, cerebellum, hypothalamus, etc.) was established (Fig. 1) (Watanabe et al., Nature Neuroscience, 2005; Sasai et al., Cell, 2008; Wataya, et al., PNSA, 2008; Musha et al., Nature Neuroscience, 2010; Uetani et al. Nature, 2011; and others). 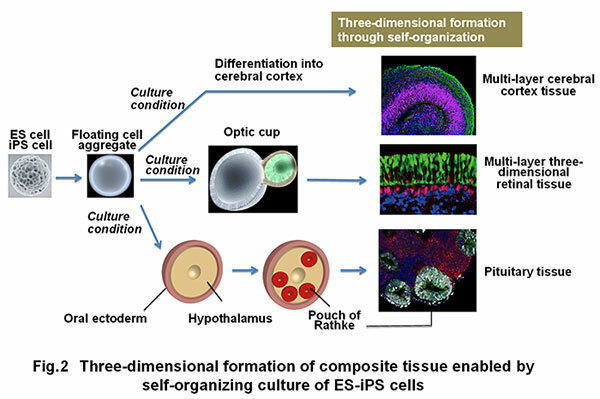 In addition, the self-organization technology through three-dimensional incubation of pluripotent stem cells was established, leading to success in producing three-dimensional tissues such as cerebral cortex, ocular (retinal) tissue and pituitary tissue in vitro (Fig. 2) (Eiraku et al., Cell Stem Cell, 2008; Eiraku et al., Nature, 2011; Suga et al., Nature, 2011). B) During past attempts of research and development on human ES-iPS cells, a major problem serving as the obstacle against practical use was “frequent loss of cell viability during the course of dispersed culture.“ This problem made it difficult to conduct large-scale incubation of human ES cells or iPS cells. The award winner elucidated that this problem is attributable to intracellular Rho kinase activation and found that the use of a Rho kinase inhibitor can suppress the loss of cell viability (Fig. 3) (Watanabe et al., Nature Biotechnology, 2007; Ogushi et al., Cell Stem Cell, 2010). 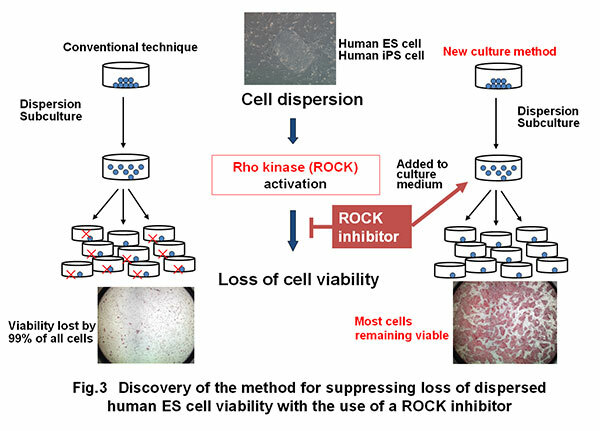 This method of Rho kinase inhibition established by the award winner has been accepted widely as the standard technology worldwide, enabling large-scale incubation of human pluripotent stem cells and the cells yielded from their differentiation (Fig. 4). 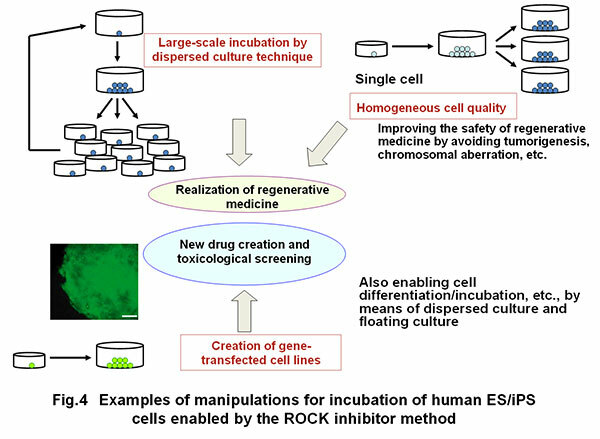 Furthermore, the use of a ROCK inhibitor has enabled cell cloning (formation of colonies from separate cells) and gene knocking out with the use of cell cloning although these manipulations were previously difficult with human ES-iPS cells because of loss of cell viability. Furthermore, high level quality control by cell cloning is now possible when these cells are applied to healthcare. As described above, the award winner has established the method for large-scale incubation of human pluripotent stem cells as well as the method for selective differentiation and incubation of neurons of various brain areas from pluripotent stem cells making use of the principle of embryonic development. These performances have expanded the possibility of regenerative medicine for CNS diseases remarkably. Regarding the technology for induction of differentiation from ES-iPS cells to retinal cells (pigmented epithelial cells), a preclinical study aimed at applying the technology to transplant therapy (for treatment of aging-related macular degeneration, etc.) has already started, and a plan for clinical application is now being devised by the group led by Dr. Masayo Takahashi (Foundation for Biomedical Research and Innovation, Kobe, Japan). Development of the technique for transplant of pigmented epithelial cells to humans is at a more advanced stage, and clinical trials on this technique is expected to be started before long. Furthermore, induction of the differentiation of animal and human ES cells into midbrain dopaminergic cells in vitro has succeeded much time before, enabling high efficiency production and purification of cells. The study conducted jointly with the Department of Neurosurgery, the Institute for Frontier Medical Sciences and the Center for iPS Cell Research and Application of Kyoto University revealed significant therapeutic efficacy of ES cell-derived dopaminergic cells transplanted into the brains of crab-eating monkeys (Macacca fascicularis, a model of Parkinsonian disease). This was the first report in the world on successful preclinical study of ES cells at the monkey level. The self-organization technique has enabled formation of the three-dimensional structure of cerebral cortex tissue and multi-layer retina as well as formation of the functional three-dimensional pituitary gland (a center for endocrine function). These are remarkable successes allowing “transplant of functioning tissue” yielded from pluripotent stem cells, breaking through the limitation of conventional cell transplant technology. These techniques represent the technology for artificial formation of “three-dimensional composite tissues” based on a new idea and will contribute greatly as innovations stimulating the remarkable advances in regenerative medicine. These techniques will be useful not only in regenerative medicine but also in tissue level analysis of disease models if combined with the patient-derived iPS technology, providing an excellent tool for new drug creation, studies on etiology of diseases, and so on.